That means we are going to once again celebrate cosplay couples in love! Why, because I said so. Also, because it warms my heart and is part of what really makes me happy in the cosplay community. Well, because it makes me happy. It feels right. We are inundated with so much negative news and event coverage. We are surrounded by a world that seems to enjoy love falling apart more than we do love itself it seems. When it comes to cosplay, we mostly see one hot person or another, even if they are in a relationship. Rarely do we see happy couples sharing this hobby. So why not feature it more often. Why not make a month of love and just glorify people who decide to be nerdy together. To share a hobby, to share their love. Even if they are in different fandoms, even if one has to drag the other. The simple act of sharing a hobby with someone you care for is beautiful to me. So yea, let’s get this adorable show on the road. I hope these posts warm your heart as much as they do mine. Let’s start off with these two blonde bombshells I managed to get an adorable picture of at AnimeNext. So I met Katie at Anime NYC during it’s first amazing year and was awestruck at her beautiful Taako cosplay and awesome chill attitude. She just so happened to be pals with some of the nicest folks in the community so it all worked out. At AnimeNext I was lucky enough to meet her boyfriend James who was super nice and staring at Katie with big, proud, love bug eyes. It was adorable, and they were adorable. 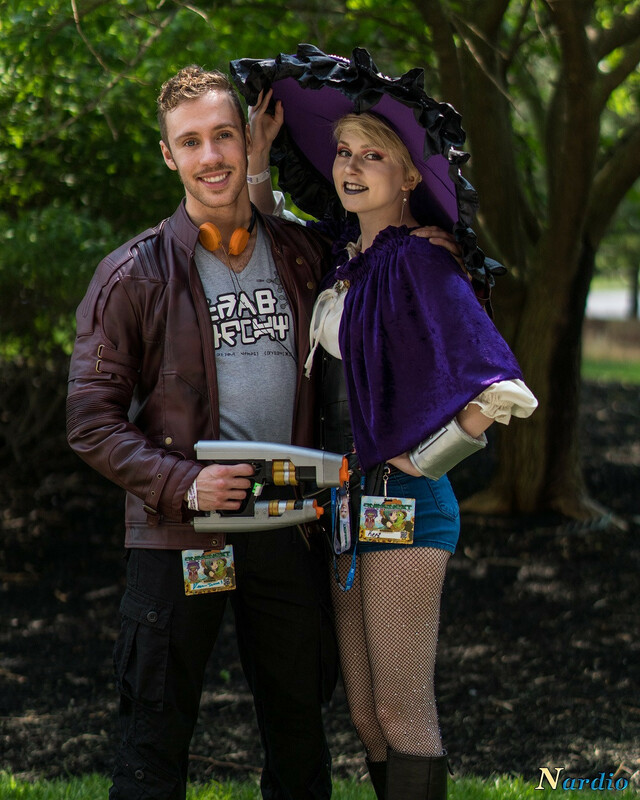 He was a handsome Star Lord and she was a pretty witch,… I think, I don’t know, I don’t watch the show. Anywho, we got a few pictures and the above shot is my fave. Honestly, it doesn’t do them justice, but we are in talks of shooting again together in the near future. I hope you liked the picture!